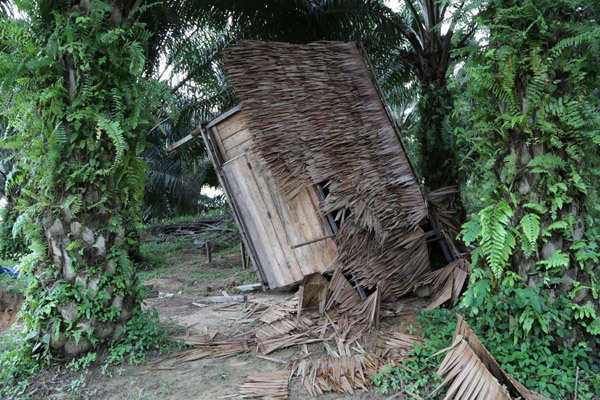 Indonesian security forces allegedly stormed several villages inside a Sumatran palm oil plantation concession last weekend and earlier this week, accompanying company staff and hired thugs accused of destroying dozens of homes and looting residents’ property. Witnesses said the raids began when members of the Indonesian military (TNI) and the police mobile brigade (Brimob) descended on Padang Salak hamlet in Bungku village at 4 p.m. on Dec. 7 together with PT Asiatic Persada personnel and local thugs paid by the company. Norman estimated that as many as 1,500 staff, thugs and security forces were involved in the raids on Saturday and Sunday, a figure also reported in multiple Indonesian news outlets covering the attack. According to a report on Monday by the Indonesian news portal beritasatu.com, some residents tried to stand their ground but were overwhelmed by the size of the mob. At one point on Sunday, according to the report, the clash came to blows and security forces fired shots into the air. Norman also told Mongabay-Indonesia that police and military had fired shots during the conflict and that company security officers and thugs armed with knives and machetes had tried to attack residents. Around 70 residents who had tried to fight back to prevent the demolition eventually fled. One community member was seriously injured when his hand was cut, Norman said, adding that several motorbikes owned by residents were also destroyed and a box containing cash and jewelry was stolen. On Sunday, some members of the community living inside the concession reportedly responded by burning a guard post and company warehouse in Padang Salak. Two residents were arrested after the incident, and, as of Dec. 14, remain in detention. Norman added that police were also attempting to arrest community leaders. These evictions are the latest incident in a more than 25-year conflict between PT Asiatic Persada, which until earlier this year was owned by palm oil giant Wilmar, and the indigenous Batin Sembilan community living inside the company’s concession in Jambi province on the island of Sumatra. 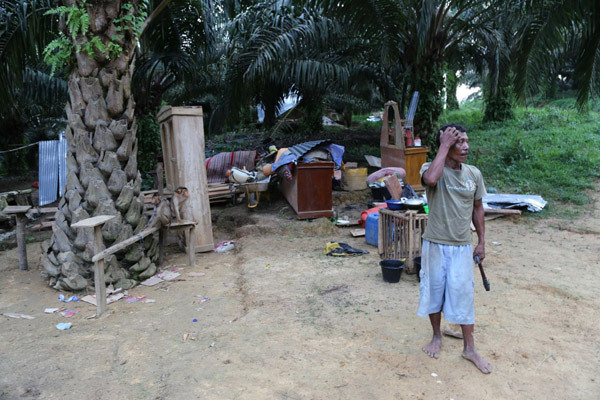 Wilmar had earlier been accused of destroying the homes of 83 families living inside the concession in 2011 following another violent clash – also involving Brimob forces – over allegations that members of the community were stealing palm fruits from the company. After the 2011 incident, human rights groups helped the community file complaints with the Roundtable on Sustainable Palm Oil (RSPO) and the World Bank Group’s private sector lender the International Finance Corporation (IFC) – both of which have standards in place designed to prevent member companies or borrowers from violating the rights of local communities. Wilmar is a member of the RSPO and received financing from the IFC, and in response to the complaints the IFC’s Compliance Advisor Ombudsman eventually stepped in to mediate talks between the company and members of the affected community. However, earlier this year, Wilmar sold PT Asiatic Persada to two non-RSPO companies that do not receive IFC financing – meaning they are not bound by the same commitments to resolve the dispute. One of the buyers, PT Agro Mandiri Semesta (AMS), is a unit of the Ganda Group, a business group owned by Ganda Sitorus, the brother of Wilmar founder Martua Sitorus. The IFC formally withdrew from the case in October after the new owners decided not to continue the IFC-mediated talks. Now it appears that PT AMS is resorting to the same tactic used by Wilmar in 2011 and forcibly evicting residents. According to multiple reports from victims and members of Suku Anak Dalam 113 – a group composed of members of the indigenous Batin Sembilan community who claim to hold the rights to over 3,500 hectares of land inside the concession – the evictions continued throughout the week and into the next weekend as company personnel and hired thugs, escorted by government security forces, destroyed homes and drove residents from at least two more hamlets in the concession. Basron, a 41-year-old resident of Pinang Tinggi, was in his home on Wednesday morning at 10 a.m. when he felt his house shake. He went outside to see his home surrounded by plainclothes thugs and PT Asiatic Persada employees wearing green shirts, escorted by several TNI and Brimob members. 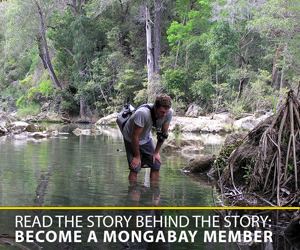 Basron told Mongabay-Indonesia that the thugs and company personnel were armed with sharp weapons such as knives, axes and machetes, while military and police carried firearms. They had driven to the hamlet in dozens of Mitsubishi pickup trucks, also bringing heavy equipment including an excavator, which they used to destroy the homes. In total, Basron estimated around 700 people came as part of the “integrated team,” splitting into several groups to carry out the evictions. Each group was composed of dozens of thugs and PT Asiatic Persada employees and escorted by police and military personnel. After removing his possessions, Basron watched as a member of the team used the excavator to destroy his home. Once the house was destroyed, he said they instructed him to quickly clean up the debris. “If it’s not clean, we will come again tomorrow. We will burn it all,” they said, according to Basron. Basron said they also looted his livestock, taking away a chicken and several other birds worth Rp 600,000 ($50). Other Pinang Tinggi residents also reported members of the eviction team stealing livestock, cash and other valuables. “My cash box was filled with Rp 6 million and they dismantled it and took what was inside,” Daim, another Pinang Tinggi resident, told Mongabay-Indonesia, while showing the broken box. “Diesel fuel and oil, they spilled,” Daim added. “If they had been able to lift it, they would have even taken my generator. Victims also reported having their cell phones destroyed when they tried to photograph the evictions. “Don’t take pictures of our actions,” an integrated team member allegedly told Meldi, a 25-year-old Pinang Tinggi resident, shortly before destroying his phone. Meldi was still able to snap several photos of the raid using another cell phone, but villagers said they have little documentation of the evictions while they were taking place since they were told not to take pictures or use their phones. Basron said the integrated team destroyed 109 homes in Pinang Tinggi on Wednesday. 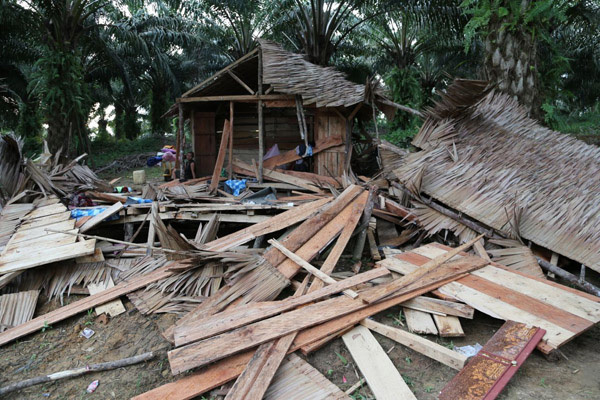 Another 31 homes were reported destroyed during evictions in Padang Salak on Dec. 7 and 8, while six homes were reported leveled in Terawang hamlet. In total, victims said the teams destroyed 146 houses over three days. 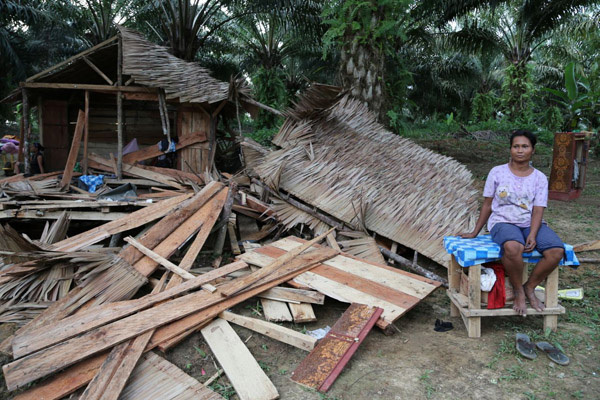 Reports also indicate evictions were carried out on Thursday, Friday and Saturday in Tanah Menang hamlet, where another 600 homes are located, however Mongabay-Indonesia has yet to confirm how many houses were destroyed in those raids. “This violent action was undertaken in defiance of years of efforts to resolve the land dispute,” said Marcus Colchester, a senior policy advisory for Forest Peoples Programme (FPP), one of the human rights groups that helped community members file complaints against Wilmar after the 2011 evictions. According to Colchester, this case reveals a major weakness in IFC standards. “It shows that when an IFC client, like Wilmar, gets caught out for violating the IFC’s Performance Standards, with which they are contractually bound to comply … they can evade their responsibilities just by selling on their investment,” Colchester said in an email to Mongabay-Indonesia on Friday. “Apparently, the IFC has no recourse in such an eventuality,” he added. Colchester also said the case raises questions about Wilmar’s commitment to socially responsible business practices. “[A]s a prominent RSPO member that stands on the Board of the RSPO, Wilmar has found it more convenient to sell PT AP [Asiatic Persada] than bring the operation into compliance with the RSPO standard,” he said. “The case raises a big question-mark over the sincerity of Wilmar’s recent, much publicized commitments,” he added, likely referring to a recent zero-deforestation pledge made by the company, which includes commitments to respect human rights and seek free, prior and informed consent from local land holders. Meanwhile, while the new owner, PT AMS, is not a member of the RSPO, other companies within the Ganda Group are members. In August, Colchester said, the RSPO secretariat wrote to the Ganda Group and asked it to clarify plans to bring its operations into compliance with RSPO standards.